Copyright: Artists whose submissions are chosen for the exhibition grant Mills Pond Gallery the right to use properly credited accepted images for the purpose of marketing the exhibition and for display on the gallery’s website. 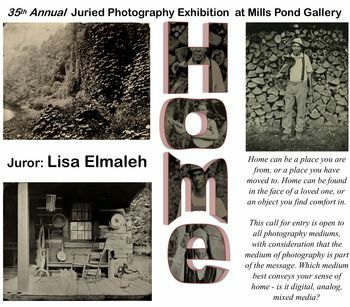 Smithtown Township Arts Council seeks entries for its 35th Annual Juried Photography Exhibition at the Mills Pond Gallery. Home can be a place you are from, or a place you have moved to. Home can be found in the face of a loved one, or an object you find comfort in. This call for entry is open to all photography mediums, with consideration that the medium of photography is part of the message. Which medium best conveys your sense of home – is it digital, analog, mixed media? Exhibit Dates September 24 – October 23, 2016. Image requirements: 72 DPI jpegs -sized at 3000 pixels on the longest side. Submission of digital photographs by email or on CD by post.